For the first part of the season, I was feeling quite proud of myself. 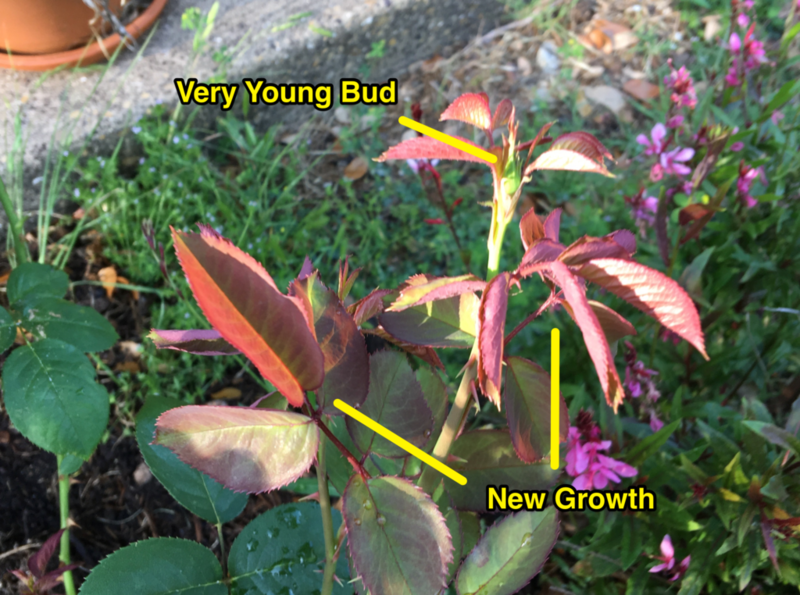 I had identified the Peace hybrid tea rose in our front yard. It had also produced two of the most stunning blooms I’d ever seen it produce. Two weeks later, the new growth slowed and almost came to a halt. There were 9 new buds forming. The younger 4 of them haven’t formed completely, while the other older 4 are kicking it into high gear. As a result, the younger leaves don’t seem to be growing very well either. It wasn’t until after a thorough inspection of the canes and leaves that I discovered rose mildew. Either way I had to do some serious research and fast. I’ve heard a lot of bad things about mildew. I came across one particular article that offered a homemade solution on how to get rid of mildew on roses. I wanted to get a head start on controlling the disease and since I already had all the ingredients available, I decided to whip it up. Directions: Mix all ingredients well before pouring into a spray bottle. Apply evenly to leaves and canes in the morning to avoid burn. Note: This recipe reduces and multiplies really well. To treat a mildewy rose bush, start by preparing an anti-bacterial cleansing solution of 1 part bleach to 4 parts water. You’ll need this to clean your pruning shears before and after you trim any diseased leaves and canes from the plant. You’ll also need a plastic bag and your bottle of fungicidal spray. Next, make sure your hands and arms are protected with thick gloves and layers of clothing. Using your clean shears, remove any leaf clusters and canes that have signs of mildew. Place them in the plastic bag, being careful not to have them come in contact with any other rose bushes or plants in the vicinity. While you’re in this stage, you may as well trim off as many leaves and unnecessary canes as possible in order to make sure the shrub gets as much airflow to keep the leaves dry and disease free once you’re done. Once you’re done with your pruning, securely tie off the plastic bag and throw it in the garbage. Do not compost. Spray the canes and leaves evenly with one layer of the fungicidal spray. Reapply weekly until signs of mildew have reduced or disappeared. Reapply after rain. .
Clean your pruning shears and whatever tools came in contact with the diseased bush in the bleach solution you made earlier. Toss your gardening gloves in the wash.
After the first treatment, I saw an improvement almost overnight. The leaves that were still maroon and weak were beginning to turn green. And two buds opened later that week. There were still some canes that showed signs of rose mildew, so I repeated the process of trimming the leaves and spraying. Another week passed and almost all major canes showed significant signs of improvement, with the exception of one that’s still struggling. The latest update on Peace. She’s doing much better. Most of the diseased leaves have been removed and the buds that were struggling are finally opening. 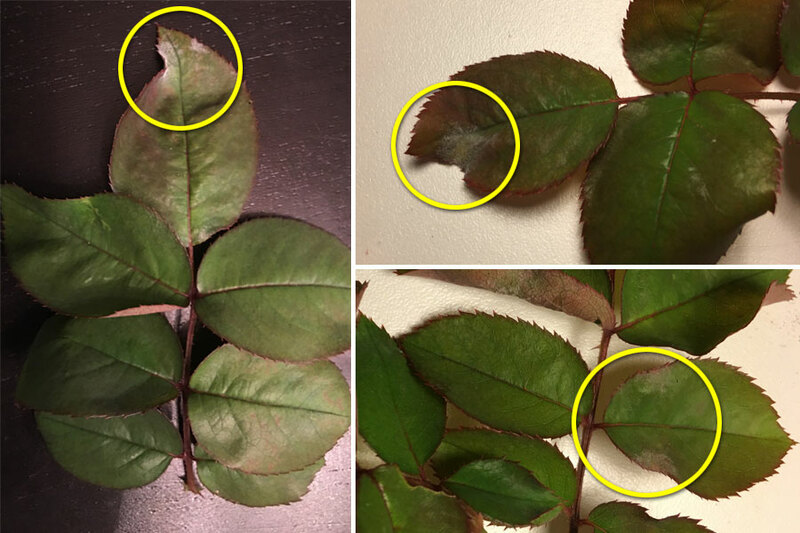 Besides the homemade fungicide and all the other commercial fungicides available at local retailers, there are other steps you can take to reduce the chances of your roses falling victim to this ruthless disease. Prune well. I think this is probably one area where I failed. There were parts of the bush that were taken over by leaf clusters. Having poor airflow through the plant creates the perfect environment for mildew to grow. And since we had been experiencing some cool, high humidity spring days, that made it even worse. Gently shower the plant with water first thing in the morning. Showering the plant with water may sound contradictory to keeping the plant dry, but just a bit of water can help wash away any bugs, mites, or spores. It’s important to do this step first thing in the morning (not at night) especially on a forecasted sunny day. As long as your rose gets full sun at least 6 hours a day, most of the water will evaporate off the leaves within an hour or so. Water the base of the plant in the morning. Last but not least, don’t water too late in the day. Your rose needs all day to be able to absorb the nutrients from the ground before going to “sleep” at night. I mean really, do you like going to sleep with wet socks and shoes? Your rose doesn’t either. 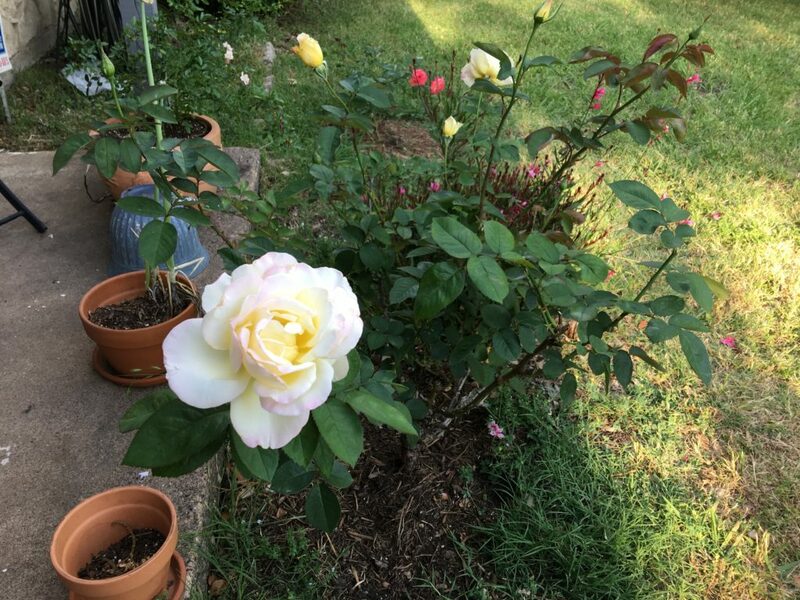 Keeping mildew away from your precious roses can be easy as long as you adopt a few habits that will keep your rose bush in tip top shape.